By NATHAN EARLE // With the electric guitar skills of Max Cheswick, the bass of Michael Cook, and Ray Maestra’s steady beat, Crystal and Angela Lariza now descend upon the city as the soaring folk-rock quintet Corner. Every clear evening, from atop the highest perch in the Rose City, the dynamic folk rock duo of the Lariza sisters surveys the glowing pink Cascades in the setting sun. From their high vantage at the Portland City Grill, the sisters have drawn strong support to their cause. 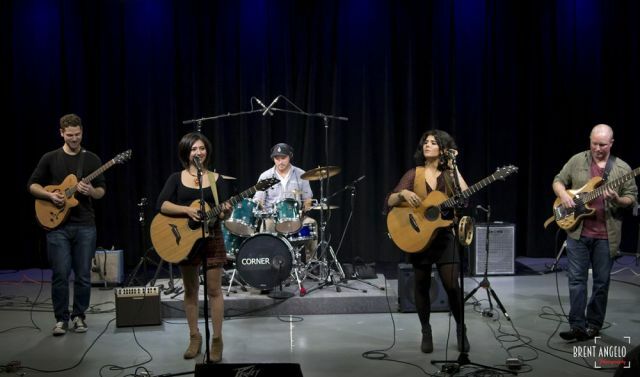 With the electric guitar skills of Max Cheswick, the bass of Michael Cook, and Ray Maestra’s steady beat, Crystal and Angela Lariza now descend upon the city as the soaring folk-rock quintet Corner. The seamless and powerful relationship of the sisters' vocal harmonies will prove more than sufficient to propel this atmospheric and jubilant group into broad horizons, protecting Portland from the doldrums of coffee shop open mics and cringe-worthy Indie Rock.